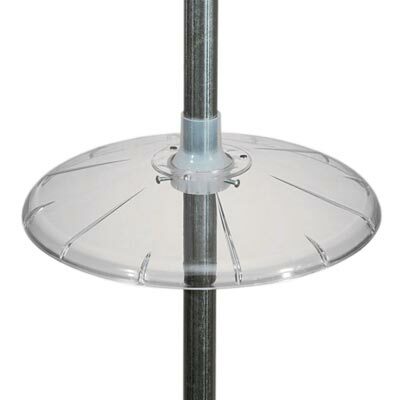 Stop squirrels from terrorizing your feeders using the Heath Pole Mounted Squirrel Baffle. This durable, polycarbonate plastic baffle stays clear, and installs easily onto your existing pole. The simple design fits poles from 0.5" to 1.25" in diameter, and its plastic collar offers a snug installation. With easy assembly and affordability, your feeders can be protected from squirrels using this Pole Mounted Squirrel Baffle. Lifetime guarantee.